The book fair is used to motivate students to read and to promote the importance of literacy. Family night is used to encourage parents to read with their children and to view the variety of materials that they can utilize to assist their children in their education. Alto Bonito is known for bringing book characters to life. This year they were visited by Junie B. Jones. Jones is a fictional character in a children's series written by Barbara Park and illustrated by Denise Brunkus. Junie B. Jones is the main character in the comical series. She is first introduced as a kindergartener and is currently a first grader. She exemplifies many of the comical aspects of childhood: fear of monsters, grammatical errors, dealing with siblings, the first day of school, and innocent crushes. She stopped by to read to the students one of her favorite books entitled Junie B. Jones is a Graduation Girl, by Barbara Park. 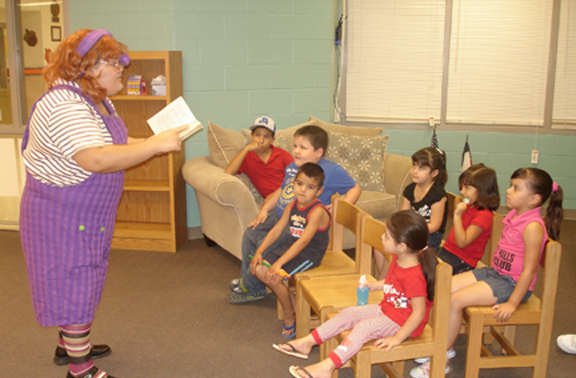 Pictured above: Miss Toni Garcia as Junie B. Jones and students from the Alto Bonito Community.